Every now and then, some eccentric altruist gathers up his assets and donates them to the United States Treasury. As a result, our current or future tax bills must fall. The beneficiaries are the many millions of U.S. taxpayers, each of whom experiences a tiny reduction in his tax burden. But we do not all benefit equally. Those of us in the highest tax brackets—by and large, the richest Americans—collect disproportionate shares of the gift. An alternative strategy for the altruist would be to convert his assets to cash and, instead of giving them to the Treasury, hold a bonfire. The result is essentially the same… your share of the benefits is proportional not to your tax bill but to the quantity of cash you happen to be holding at the moment of the bonfire. There has been some discussion about whether or not to vote. The argument in stages can be read in the pages above. I am of the I-don’t-vote camp. That has afforded me certain ethical peace over the last year, especially when I found myself offering policy advice to hopeful politicians. I felt I could be more objective and more bold in my presentation of advice than I likely would have been had I had a dog in the fight. I continue to dwell in my I-don’t-vote position for a few reasons. First, my vote is probabilistically indecisive. Second, the space between available platforms is not really all that big. Third, who is elected does not matter all that much, and should not matter at all. I will add a new justification momentarily.
.@jbarro @samwilkinson Revocation of capitalized privileges is an injustice. All reform is a fail. Burke's Law holds. I am utterly pessimistic about the capacity for an organization founded upon the monopoly of force to be capable of positive action, or reform that justly compensates those harmed by a change in policy. In Landsburg’s model above, I would expect the Treasury to leverage any bequeathment through some sort of multiplier into further indebting the remaining taxpayers. I agree, the bonfire is a much better idea. And here is where I part from the bleeding heart libertarians who believe in reform. They have not as of yet been sufficiently disappointed by past reforms. It has been too easy to allow one’s perspective to be biased by only observing the survivors of past reforms. The uncompensated and other losers fall out of the data. Similarly, I part with many religious economists. There are those who attempt to justify markets as moral from a particular theological point of view. They are really interested in defending the status quo. Those positions tend to privilege their own theological priors because the advocate is an ultimate beneficiary. I cannot remember ever having read a free-market-Anabaptist point of view other than my own. I should suspect that I am wrong. Both parties can point to peaceful and beneficial resolution of collective action problems through private agencies and local levels of governance. They think those processes can be transferred to higher levels of governance. Often a wise or benevolent executive is presumed. Among the doctrinaire, dominionism (the idea that God’s Chosen should seek to fill every public office, and the eschaton will obtain once they do) is not uncommon. My contention is that collective action problems resolved outside institutions founded on violence are different in kind from collective action problems resolved through voting. My new justification for not voting is that in stark comparison to some who advocate the exclusion of particular voices from the ballot box, my abdication from that platform amplifies the voices of others. As a married white male protestant with education, it may behoove me more than anyone else not to vote. It should be clear that when some urge libertarians to vote, they really mean libertarians like themselves, libertarians like me (though with a different attitude). They really want to amplify their own voices, and are demonstrably unwilling and uninterested in learning from other voices. They want to be libertarian dominionists. They miss the idea that democracy is about deliberation and skip straight to decision, in the same way that mainstream economists skip straight over choice and jump to optimization, in the same way that I am prone to mansplaining, and in the same way that white churches like to be in control of racial reconciliation efforts with black churches. Featured image is The Parable of the Good Samaritan by Jan Wijnants. First, if this is true, then the rise of whatever is good about Western Civilization must have had an incredibly long incubation period. Long enough that dialectical materialism might even be true. The Great Enrichment postdates the emergence of Christianity by 1800 years, give or take; and Christiandom (as established by Constantine) by 1500 years. Second, there are enough contradictory data points, both Christian nations that lagged in making progress, and nations not explicitly Christian that did not lag so, that any interpretation of the existing data that arrives at this conclusion is a spurious reading at best. Finally, I find the elements of Western society that are most imbued with Christiandom the most troublesome. That is, whatever the influence of Christiandom on Western society, I hardly consider it a positive. Western society has progressed, since the Great Enrichment, wherever the radically egalitarian treatment of processes of coordination and cooperation among disparate individuals has been adopted. Liberalism. This is from my point of view a particularly Christ-like way to treat people, but Christiandom has not always acted so Christ-like. A Christ-like treatment of people requires sacrifice, which goes beyond egalitarianism-in-process and practices personal voluntary sacrificial charity, even toward one’s enemies. Such an attitude cannot be enforced or underwritten institutionally. It must be an organic byproduct of gratitude for Jesus’ completed work in an individual. Where more people are living in a Christ-like manner, we can hope to see a more egalitarian attitude prevailing. Thus, importantly, there is nothing special about the institutions of Christiandom that helped to bring about flourishing. Rather, where those institutions enjoyed a special relationship with privilege and power, Christiandom was a rot. I do think that Christ-like behavior may have been important for the rise of flourishing, though such behavior would have happened on such a micro-scale that it would not have been easily reported. Particularly since the practitioners of said behavior would try to remain anonymous where possible. And let me clarify that Christ-like behavior may not be peculiar to nominal Christians. Tonight I listened to a Muslim man talk about how he forgave the Fishtown racist who tried to shoot him in the head with a shotgun, and even worked to prevent the murder-by-State of his would-be murderer. Where individuals organically generate trust among neighbors and equal treatment towards others (sympathy), as compared to circumstances where individuals generate distrust and tribal attitudes (faction), social coordination and cooperation are free to emerge. Institutions that encourage sympathy and discourage faction provide fertile soil for the emergence and acceptance of markets, and dignity toward marketeers. Impersonal exchange rests upon the virtues of impartiality. Though expressed in somewhat different terms, Cathy, following Auntie D, gets it right. Will Wilkinson’s criticism of Karl Hess’s dictum, as often attributed to Barry Goldwater, is clever and for the most part correct. But I’ll point out a few flaws, and a better way forward. Wilkinson thinks that the first half of the statement “extremism in defense of liberty is no vice” in plainly a violation of the Aristotilian understanding of virtues. Quite right, if one takes Aristotle as an authority, as Wilkinson confesses. Hess made the mistake of framing the statement in terms of virtues and vices, so working within that system is defensible. But I will claim that virtue ethics are insufficient for and unnecessary to do-ing justice. The porridge of virtue may always be just right, but that must be in reference to something, viz. the status quo. Moderation cannot get us out of a system of injustice or a transitional gains trap. But Wilkinson is right that extremism leads typically to violence. He then identifies Malcom X as embodying the ethic of extremism. X was known to reject the aid of white sympathizers. Under extremism they only get in the way. X saw the Civil Rights movement as blacks stepping up to claim equality as “within their rights” and when rights talk gets started, “any means necessary” quickly follows. That white supremacy required some sort of exogenous shock to be broken is granted. We shall see what sort of shock actually worked. Dr. Martin Luther King Jr. is Wilkinson’s second example, after Milton Friedman, both masters of rhetoric, or sound persuasive argument. Wilkinson then claims that “the virtue of the tactics” employed by King determined the success of the bus boycott and the civil rights movement. But that is not enough. King openly accepted, and I will claim relied upon, the help of whites, in contrast to X. The vehicle for success was less the distinction between extremes and moderation than the composition of individuals that were involved. King succeeded because he captured the sympathy of a sufficient number of whites. Those whites got involved and supported his movement. White people marched with King, supported his movement, and openly advocated for it. Sympathy works (roughly) like this: The class that I consider “other” is at a social distance far enough from me that I don’t sympathize with their suffering. I sympathize with people who are like myself. When someone whom I consider alike to myself, someone with whom I sympathize, demonstrates sympathy with those I consider “other” I am forced into making a decision. Either I also extend my sympathy toward the others, or I must push the one whom I considered alike into the other category. Extension of sympathy is very costly. It requires a kind of abdication from the privileges I enjoy under the status quo. The loss of sympathy with a member of my community is also potentially costly. I may lose a friendship, or choose not to do business with such a traitor, and thus lose some surplus from exchange. The sympathizing of the traitor has forced me into a corner. I will lose something either way, especially in the short run. The question is whether I can see the potential long run gains from the extension of sympathy. Many cannot. Again, Wilkinson frames his discussion in terms of compromise and rhetoric, “moderation in principle means hammering out workable compromises with people who hold to different principles. If that’s a vice, we’re all in big trouble.” Indeed. But compromises only work when there are mutual gains. With patterns of injustice, there are not always Pareto opportunities such that all will benefit, especially given heterogeneity of discount rates. Many people were harmed materially and psychically by the outcome of the Civil Rights movement. If we include Johnson’s welfare programs as among the outcomes of the Civil Rights movement there are many who will claim that even blacks were harmed. Wilkinson identifies two large parties, those that started thinking seriously about politics by reading Ayn Rand, and those that started by reading Karl Marx or Noam Chomsky. I belong to a minority that got started with Stanley Hauerwas and John Howard Yoder. The Hauerwasian mafia, as they are sometimes identified, similarly start from a position of non-violence. An economist who gets started here will read Murray Rothbard at some point and find some purchase in the Non-Aggression Principle. So I did. Rand and Chomsky came later for me, and then Aristotle and finally Adam Smith. I am certain that I misunderstand all of these. The one option that economists and political theorists tend not to consider is simple charity. The way out of a transitional gains trap must be compensated for, but by whom? I maintain that it must be paid for by those who sympathize. Dr. King’s movement was not successful because of moderation, extremism, or complacency. That movement worked because sympathizers gave. White people abdicated privileges, and made willing sacrifices for the sake of blacks. Oppressed minorities are incapable of rising up to positions of equality in any other way. There is nothing about a bus boycott or a sit in or a march on Washington DC that can succeed unless some whites sympathize. Libertarians are cavalier about transitional gains traps. They say Kaldor-Hicks improvements are the best we can hope for in the real world. Systemically this is true. Bryan Caplan will say it is true even about wristwatches. But abdication and charity, sacrificial altruism as I have called it, is the only approach that has effected praiseworthy reforms. My only complaint is that we typically don’t have the patience or the fortitude to follow an ethic of sacrificial altruism all the way through a reform. I can’t expect the oppressed to wait. Birmingham jail proved that to us. But that only means that I need to get moving faster. We are allowed to rant here, right? Those who subjectively value the increase in virtue should expect to have to shoulder that burden personally. The only true route to reform, whether of society or the individual, is through personal expense. This is perhaps the point of departure between Adam and I, at least in our understanding thus far. I can demonstrate charity in a way that words cannot. Words are ultimately about exchange. This is something I hope to get at in my research on Richard Whately. There are some behaviors that demonstrate virtue above that which can be articulated. Those virtues are not open to debate or discussion. They are also not amenable to imposition. They truly must be caught, and voluntarily, rather than taught, didactically. In other words, I am not really trying to persuade anyone to adopt my ethic. I try repeatedly to say that I don’t know why anyone would adopt my ethic. But I also don’t see a way to effect reforms that reach Pareto outcomes without direct personal sacrifices. The usual response is that my ethic is vulnerable to moral hazards. Precisely. The goal is not really the reform, but the transformation of the individual. So volition is central. So there is an ought that is merely moral, that is, conjective, or socially praiseworthy. Then there is that peculiar ethic that I try to hold myself to, that goes beyond the conjective, beyond what I can hope to persuade you to do through words, beyond that which I can motivate you unto through appeals to your self-interest no matter how long your time horizon. I’m saying my ethic is impossible. But that is why it is true religion. It is not entwined in any way with self-interest. All religion that so compromises itself I count as less than. And that lesser religion is usually sufficient for social progress. But it cannot motivate the redemption of sinners. No simply moral religion would allow Saul, murderer of Christians, to become Paul. It is offensive to most ears, and rightly so. It says that your morality is insufficient. I illustrate this by showing that all reform is a fail. Inasmuch as reforms are justified by Kaldor/Hicks efficiency rather than Pareto efficiency they implicitly claim that the best morality we can hope for is one that sacrifices the losers for the sake of the whole. You see, the losers of such reforms are never accounted for when measuring the success of the reform. They are dead. Pareto efficiency is not a possibility, unless people are willing to make personal sacrifices. Then it is not a political reform really, but an anarchic mob spite-ing the illegitimacy of the regime by accomplishing what the regime cannot. In other words, I am saying that Christians should shoulder the full burden of the reforms they advocate personally and sacrificially, otherwise they are compromising their religion. Can a Christian, can I, remain involved in politics, continue to vote, continue to participate in the conjective? I suppose so. But I must not bring any of my radical sacrificial altruism into that exchange. This is how I manage to remain an economist, despite my ethic. I take the Misesian / Hayekian approach as demonstrated in the Socialist Calculation debate: Given the ends specified, will the selected means achieve those ends? There is no value judgment in this. It is purely conjective. Consequently, my primary function in political discussion is to say “no.” That is, with Hayek, “The curious task of economics is to demonstrate to men how little they really know about what they imagine they can design.” This is why economists are unpopular. I have no ideal outcome. I am not deluded into thinking that all individuals could possibly adopt this radical sacrificial individualist ethic. Again, I don’t know why anyone would want to adopt this ethic. I think the primary function of the ethic is prophetic, that is showing that the emperor has no clothes. Showing that the tidy reforms of the past have actually prejudiced some at the expense of others. Showing that the advocacy practiced on symbolic margins is not praiseworthy. Showing the Church that entanglement with the state is ultimately a harmful compromise. Showing the Kantian duty is insufficient for motivating people to do positive good. Showing that even virtue ethics leaves something undone. All of this can be done through the simple economist’s “no.” But then overcoming that “no” in any way requires my peculiar ethic. The ethic is altogether spiteful, and in spite of existing powers. It is throwing starfish back into the sea, one at a time. The positive good is important because progressives believe that the state can be effective in accomplishing it. Progressives are right that morality and virtue are insufficient for caring for the very least of these, but then they presume that the state can accomplish those ends. The economist says, “no.” the sacrificial altruist says, “I must do it.” Virtue ethics might be the best we can possibly hope for with respect for civic morality. And it is very good! Particularly when it recognizes that exchange is ubiquitous and essential. I was doing what David Levy’s students do at the Library of Congress this Tuesday (there were two other Levites nearby) when I came across this paragraph in which Frank Knight invokes the term ‘Bourgeois Virtues’. I flipped through my copy of McCloskey’s first volume, searching for a link to this text or some other connection between Knight and the term. No hits. The evil has been that on one side the economists have taken for granted the virtues of the economy, management and thrift, while the ethicists have tended to ignore or even to disparage them. This latter attitude is no doubt in part a result of the way in which the economic side of life is treated in the Judeo-Christian religious tradition. In any event, the modern mind finds it self-evident that not merely progress but civilization itself depends upon the general recognition and the conscientious practice of these ‘bourgeois virtues’; yet they have not been made philosophically respectable and one of the crying needs of the hour and for the future is that this should be done. 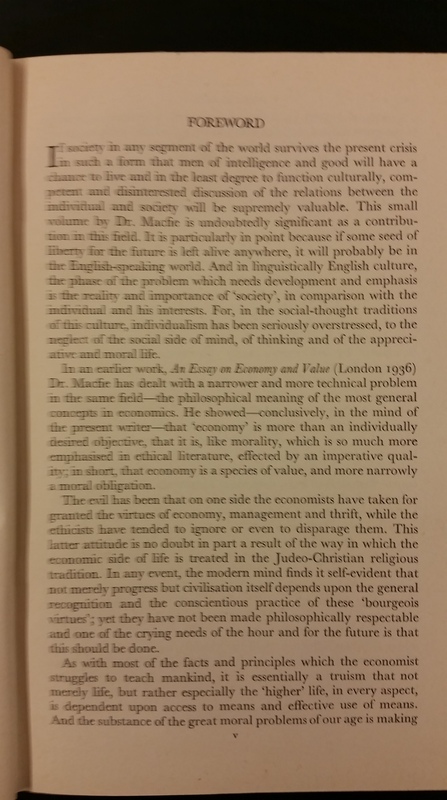 Frank Knight, “Forward” to Alec L. Macfie (1943) Economic Efficiency and Social Welfare, page v.